The greatest single lesson of the past seven days is that journalism in United the States has completely failed as an institution. The entire week the media breathlessly reiterated reports they knew were false in order to drum up a retail narrative (Pelosi’s term for shopping political stories to the news so the politicians have an excuse to “do something” about them) against President Donald Trump. Unfortunately for the swampies in media and the halls of government, not only was the narrative a non-story, it was also a complete fabrication. Womp womp. And while the entire field of journalism busied itself pretending they did not collectively land face first into the cow pie of own making, only one man seemed able to point out the “news” platform responsible for the fake news was the same discredited Buzzfeed that shopped the now infamous piss dossier years prior in order to drum up support for seditious politicians to initiate a completely fruitless investigation in Muh Russsia. That man of course was President Trump. 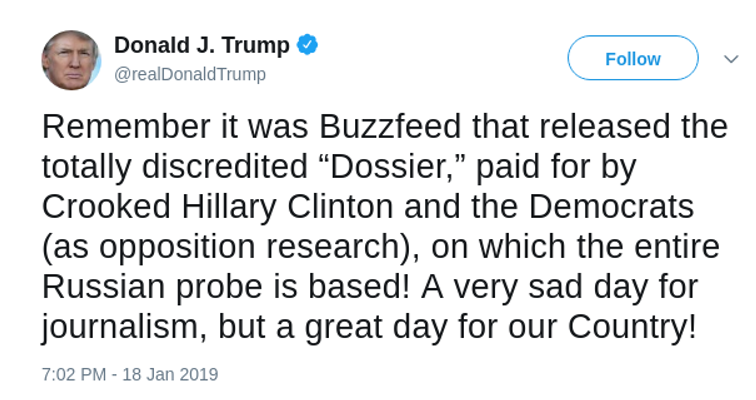 “Remember it was Buzzfeed that released the totally discredited “Dossier,” paid for by crooked Hillary Clinton and the Democrats (as opposition research), on which the entire Russian probe is based! A very sad day for journalism but a great day for our Country!” the President tweeted. As both stories are planted narratives with little meaning beyond their potential to rile up the gullible and hate-filled rubes, we should be grateful that at least the latter of two failed to reach its full potential before it was publicly blown out of the water by Robert Mueller. Yet it is hard to feel happy about dodging a bullet when the Muh Russia collusion narrative still sits ready on the launch pad. If either ploy had been successful in their ultimate goal, the press would have played a pivotal role in plunging our country into chaos. To clarify, I am not accusing the press of being indifferent to the disastrous effects of their screech-filled rabble-rousing. We passed indifference when the media frenzied Ferguson Missouri into destroying itself years ago. We are confusing tactics with indifference. The political operatives in the media are executing a battle plan and in case you have not already caught on, Mr. and Mrs. Middle America, the essence of that plan is: you, dead. Regardless of what the smiling airheads in the pressed suits are saying, they hate you and think the country and the world would be better off without you. If you had any shred of doubt about the media’s true intentions, then the events following the Buzzfeed implosion would have wiped away all traces of respectability the press had when media informers dog piled on group of minors for facecrimes. It does not matter that the full video “exonerates” the high school boys of Covington Catholic High School. The fact of the matter is even the story as deliberately skewed by lying journalists demonstrates nothing scandalous or offensive at all – especially when compared to the violent actions of Antifa youth caught on camera assaulting women and the elderly with improvised weapons and fists for the past two years. People have a right to wear hats and be in public. Among the sane, this is a reasonable position, but among American reporters like the New York Times Maggie Haberman and CNN’s Reza Aslan, this is the true crime – worthy of doxxing and threatening children. The diocese of Covington had to cancel classes at several schools the following Monday because of the threats of death and violence. And what if the result of all these calls to punch, burn, and kill children actually led to actual physical harm? That would simply be mission accomplished among those at CNN, MSNBC, Fox, Vox, and various other outlets. The rest of us are still aghast at how far beyond the pale it is to call for death for the crime of smirking while teen. As horrifying as all this is, journalism is only one institution that collapsed over the past seven days. What about government? Shut down over a simple matter plebeian safety, the very representatives who resist the common sense solution of a border wall are at once conspiring to remove a popular president because his policies and actions reveal them as corrupt double-talkers. To add to this, the entire DC establishment of unelected bureaucrats in the DOJ and FBI are playing games with our trust because – what? They think the corruption which discredits them is not already obvious? The Church is another institution which failed this week. Charitably you can argue the hierarchy threw minors to the dogs because they forgot the media makes its money spewing lies about the Faith and its adherents – especially when a pro-life protest is involved. Yet the response is sadly familiar. When confronted, Church leadership reflexively chooses political expediency over the safety of children. The leadership of Covington Catholic High and its diocese demonstrated a discrediting lapse of pastoral concern and informed judgment. Just because you can convince yourself the press is benign, does not make it wise to assume the fourth estate is taking its mandate seriously. Finally, businesses failed us. Last week Gillette was sobbing over the role of “toxic masculinity” in cyber-bullying. Never mind that bullying of any type is not strictly committed by males, the Proctor and Gamble boardroom had to foist the entire problem on a single gender because they care more about scoring political points against Trump. Yet in the face of this actual, immediate, and frightening situation of promises of death aimed at Covington students, where are the “courageous” ad men of Gillette today? Their squishy humanitarian concerns are suddenly nowhere to be found. Imagine that. Their stubborn commitment to falsehood over truth, anger over compassion, coin over principle, and anything or anyone over America is a herald of the total collapse of the West. As these institutions crumble under their own corrupt weight, we have to get to the task of universal reform. It will not be simple but as witnesses to the collapse, we have a duty to understand and convey the faults at play for the betterment of future generations.